Have you noticed that I keep posting food? I know it’s not my norm. I know it’s likely not why you come here. But it’s where I am and what I’ve been working on. It’s one of the things that challenges me most in photography – food photography is so, so difficult for me. Which makes me want to fight harder and work harder to figure it out. So I’m working on it and sharing a bit because my kids are starting to blatantly refuse photos. I’m also working on getting more vegetables into all of us – they’re beautiful and bountiful and literally right outside our door right now. I sit at the computer late at night and the house is quiet. I turn on some relaxing music or a meditation or something that would make my husband laugh if he were still down here. I plop the computer in my lap and open Lightroom. I start sorting through the photos knowing I don’t really like them. I look closely and the light is pretty, but there’s not much to them. I like simplicity, but this isn’t doing anything for me. I scroll through each one — Ctrl X (delete) — Ctrl X (delete)…over and over. One by one, I scrap them. I get to the end – the final picture while everyone was sitting with hands folded waiting to say grace. I don’t often have the patience, but I spent dinner prep half cooking and half setting up stuff to take photos in order to shoot photos of the first batch while the second batch cooked so that I could have it all timed to get some shots and finish cooking. After it’s ready, I ask for one more chance to take a photos. He’s literally sitting there saying, “Come ON!” Hands are folded. I sit. I click the shutter. It occurs to me that I’m connecting the dots. While other probably come here and see my photos and have thoughts about a style I embody – whatever the heck that means – it’s always hard to pinpoint when you’re in it. I don’t like fussy. I like clean edits. I like clean backgrounds, but I also love backgrounds with details that give some insight into the life being lived behind a single moment captured. 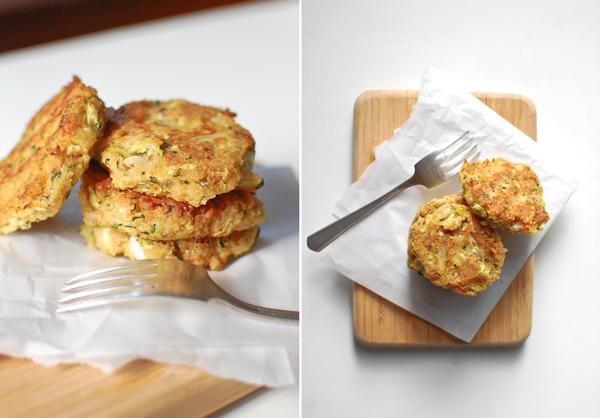 The life where I’ve been wanting to make zucchini fritters or cakes or whatever you want to call them (I called them cakes because I made them with breadcrumbs and not just flour, does that make them cakes and less like a fritter or something akin to a potato latke? Is there a legit answer to that question?) for a week. The life where any squash or cucumber comes out of the fridge with a nibble taken out of the side – it never fails. He loves to test them. The life where she watched me shred zucchini and declared immediately that she didn’t want them – she wanted only corn for dinner. Fine by me! 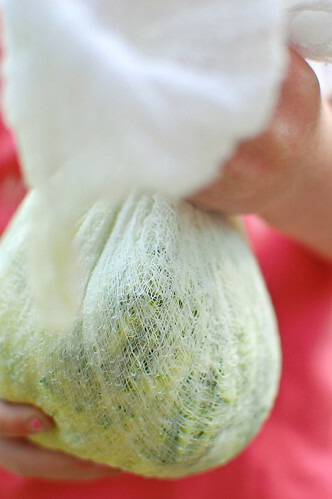 The life where he got a huge kick out of wrapping the shredded zucchini in the cheesecloth and squeezing out the liquid. The life where he thinks it’s amusing that I take pictures of food and asks me, “Why are you taking that outside Mommy? Can I hold it?” And holds the ball of shredded zucchini more gingerly than anything else in his life because he’s worried that it’ll fall open. This recipe isn’t complicated. I’ve made similar before and each time John comments that his Grandma used to make something similar. I like that – I think it’s one of those foods that Depression-Era women used to cook to make foods stretch a little bit further. You could literally substitute just about any veggie or meat in here – I’ve made amazing similar salmon sliders, many kinds of fish would work, locally they do them with ham (not my cup of tea), leftover chicken would be easy, any other sort of squash, maybe eggplant, peppers, mushrooms. Call them cakes or fritters or croquets, it’s the idea of an egg to bind+ some breadcrumb or flour sort of breaded product to fill and you have a more substantial meal. Substitute in a variety or herbs or cheese for a little more flavor, but don’t hesitate to make them if you don’t have those things. They’re simple and good and that’s the kind of food I love. Mix it all in a bowl, form it into patties and start cooking those babies! I cooked them in a few teaspoons of coconut oil. Just enough to make them crunchy but not feel like we actually fried them. I think next time that I’ll probably try baking them, just to see how it goes. Serve them with some sour cream and mix a little lemon juice and garlic into the sour cream if you’re feeling extra fancy. 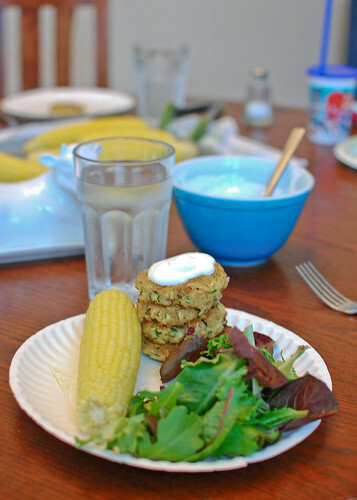 We love zucchini cakes here! We had them yesterday and even our newest little guy LOVES them! p.s. they freeze really well, too. Then you can just pop them in the oven to warm them.